2009 was the year AR games broke from the lab into the hands of consumers – and this post celebrates that achievement. So how to start reviewing the flood of AR games? By Platform? By Genre? By commercial success? By Game Mechanic? Let’s try these out. Augmented Reality games have been developed for a multitude of platforms such as PC/Mac, Nokia phones, Windows Mobile phones, Android phones, PDAs with cameras, Nintendo DSi, and the Gizmondo. But, in 2009, the most lucrative platform for developers, with the broadest distribution by far was…surprise, surprise – the iPhone. 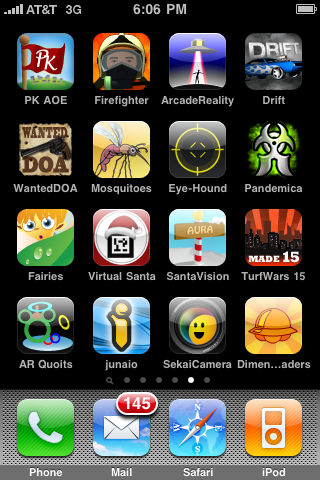 In fact, all games on our list – save for one exception – were developed for the iPhone. So the traditional way of reviewing games by platforms won’t do for this year’s review. Another popular approach to group games is by genre. When it comes to AR games genres, there’s a bit more variety than platforms: this year we have seen mostly shooters, but also horror games, a treasure hunt, and even one driving game. Still, the limited variety this year does not merit a breakdown by genre, just not yet. In addition to introducing a unique experience, Invizimals boasts a high production value and critics have been raving about it with a 7.7 average rating. However, comparing these indicators with Apple’s app store rankings will be like comparing apples to oranges (pun intended). Hence, this year I resort to slicing and dicing the AR games of 2009 – by game mechanic. The term “Game mechanics” is defined by game design scholars as “a construct of rules intended to produce an enjoyable game“. What fascinates me in Augmented Reality is that it enables a whole new set of mechanics never before seen in video games. In 2009 we have barely scratched the surface. No one knows what new game mechanics AR will unleash next, but it will surely be a lot of fun, alfresco. Following our Letter to Apple, a new iPhone SDK was released (a coincidence?) with the ability to overlay graphics on live video. This, enabled a totally new game mechanic for the iPhone, and although Apple failed to offer public access to the iPhone’s live video (an essential capability for analyzing pixels for aligning graphics with real world objects) – the iPhone became overnight the preferred device for Augmented Reality Games. So what’s the crop so far? Let’s make sense of it. Kids would love it, right? It’s actually a double edge sword. When I asked my daughter (12) to test such a game she raised her head from facebooking in her immobilized position and asked: “will I have to move”? As a developer of best selling apps for the iPhone, Freeverse decided not to go for the obvious shooter and delivered a fairy tale based theme with pleasant visuals and sounds. A clever design choice given the technical limitations: flying fairy things tend to fly slowly, all around you, and grabbing them with fairy dust (by tapping) is not as intense an action as shooting spaceships. Turn your iPhone into a magical creature-detector with Fairy Trails! This augmented reality game opens a window to the fairy world, revealing fireflies, colorful butterflies and the ever elusive fairies. Shake your device to power the detector and then scan your surroundings…to merge the real world and game world in spectacular ways! Simply tap the creatures to collect them in your jars. Reviews are enchanted by the new mechanic but are largely neutral (“a novelty?” by PocketGamer). One element missing from Fairy Trails is a radar view that shows where the creatures are located around you – an element that was added in subsequent games. Toyspring didn’t go too far with the theme choice: shooting aliens. Once you overcome the tacky-wacky design it can get pretty addictive. It has a functional HUD (with a radar view showing alien ships in 360 degrees) and is reminiscent of classic Arcade shooters: the center of the screen is the cross hair – press the shoot button to kill. For my son (16) it is a throw back to the good ol’ days of Chuck E. Cheeses. Unlike most games where you only train your fingers, you must actually move to play Arcade Reality! Arcade Reality is a low-brow shooter game with addictive qualities and it led the way for other variations on the theme. Is it a game? Or is it a simulation of real life mosquitoes hunting? Mosquitoes is a bare-bones game that uses the compass+accelerometer mechanic to overlay mosquitoes (and their annoying buzzing sound) on live video in 360 degrees. Tap a mosquito to kill it. That’s it. Some people thought it was a sham. Just riding the AR wave. However, the key issue is the mechanic. It doesn’t work in a believable way. There is no proper coordination between player movement, visuals on the screen, and the consequence of tapping the screen. It feels somewhat random. The theme is compelling: Hunt for ghosts in the real world. Use your iPhone as a set of Ghost Goggles to see into the ethereal plane. Ghosts actually exist in specific locations everywhere. Using Augmented Reality technology, ARGH determines where you are and where you’re facing, and shows you what ghosts exist around you. Still, ARGH was a brave attempt and we couldn’t wait to see what augmented reality games emerge next. Fun fact: A similar game (Ghostwire) was previously developed for Nokia phones and won awards. I was excited to see the game announcement by Presselite, a creator of prominent AR applications. I was especially intrigued by the choice of theme: instead of shooting aliens, let’s use AR to do good (fight fires)! The graphics and sound track seemed polished (90’s style), and the story was to die for. But was it any fun? And here is his verdict: “it felt like I was nursing the game…please work for me game…” or in other words…he felt pity for the game. Because flames – unlike mosquitoes, spaceships or fairies – do not just float in mid air, but usually come out of a specific object. The game mechanic limitations (inability to perfectly align graphics with objects) just didn’t work out for this game. Great attempt; bad game design choice. XMG was able to generate nice buzz in the media during the game launch, and delivered high production value to support the hype. It also introduces multiplayer support (over Bluetooth or Wi-Fi) so that players can work together as a team to dominate and destroy the aliens. A new design choice in the game was introduced: you can tap anywhere on the screen to shoot an alien ship. Pandemica transforms your device into a sub-field bio-scanner that can see the invisible alien organisms that are all around you. Your mission is to eliminate the enemy before they get you—and you get gooed. Unlock weapons such as: Missiles, CEB (Continuous Electron Beam), and the BFB (Bosonic Field Bomb) to complement your trusty standard-issue Laser. You can shoot the lasers by touching. Sweep away the enemies and save the earth! Besides the Tokyo tower in the backgroung – there is nothing new about this game. In fact it’s a step backwards from previous attempts with this game mechanic. And there’s more of the same from Gamedokan: SplatCam and Virtual Slingshot – all variations on the same mechanic. zeroGhost will turn your iPhone into a ghost hunting tracking device allowing you a glimpse into their plane of existence. While you hunt them, they try and steel your life energy until either you or they are dead. Problem is, there are many more of them, than you. Couldn’t find any reviews or videos about this game, and the game site is very laconic. I typically buy and try games I review, and I would have tried 0Ghost myself, but not for $4.99! When you see Santa, throw snowballs at him and receive gifts in return. Be careful not to hit the reindeer or they will return to the North Pole with Santa. The latest game to make it to the store has a nice screenshot, but doesn’t surpass the previous games in any other way. They have broken the barriers between dimensions to come to our reality. They are coming to kill the human race. They are coming to kill you! But you have the most powerful weapon. You can see the enemy spaceships through your iPhone camera. You can look for them in the app left bottom radar, point them with the cross hair and shoot touching anywhere on the screen. Tap anywhere on the screen, but you only shoot the alien in the crosshair. That concludes the list of 360 shooters launched in 2009. Best games in this category: Arcade Reality and Pandemica. What other AR mechanics are possible on the iPhone? Several notable companies thought that overlaying graphics on a static picture taken by the user – is cool. This mechanic did have an advantage. It didn’t rely on overlaying graphics on live video – a feature that became available on the iPhone only in September. The first game appeared as early as June. Here is the lowdown of the next mechanic I like to call – phogmenting. The Hidden Park is a magical adventure that your kids will love. It’s an afternoon out for the whole family that won’t break the bank. It’s a groundbreaking blend of fantasy and reality. Enjoy. It uses nice graphics and a story to get the young (and young at heart) outdoors to play a treasure hunt-like game. It’s tied to specific parks – but the Park Builder allows you to localize the adventure for your own local park. Although it’s not using augmented reality in the scientific sense – it’s inspired by AR concepts and could transform one day into a magnificent AR game. 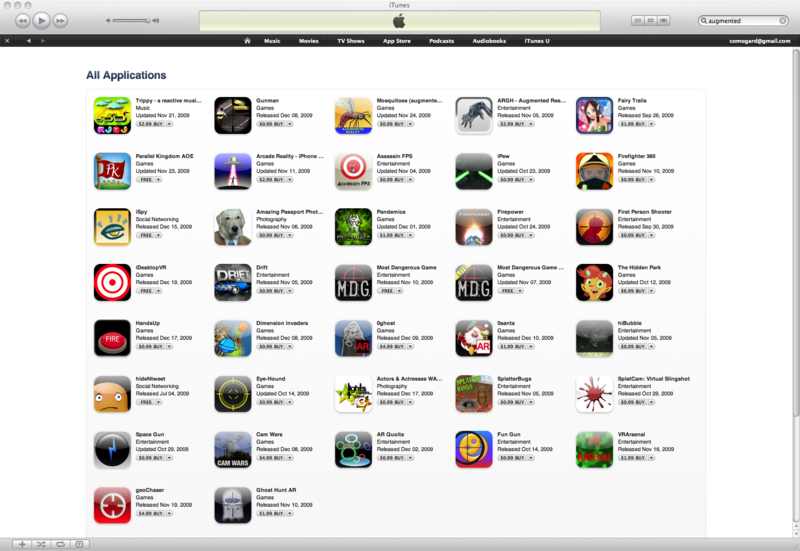 Briefly spotted in Apple’s top 25 application for kids games? Fairies Everywhere reveals magical creatures in your own photos. Take a photo and you’ll see that fairies live all around us! All the time! It’s an entertaining game for kids that creates memorable portraits for everyone – from dad to grandma and beyond. Get discounts to order prints of your fairy photos online. As much as Hidden Park hit the spot – Fairies Everywhere was disappointing: how many times do I want to see the same fairies superimposed on my living room pictures…? To be fair, it’s likely this game was originally conceived as a true AR app – overlaying muscle car CG making doughnuts – on live video). It’s probably reverted to a static image to be allowed on the app store. I can imagine this game being a tad more fun if played on dynamic video; players would be manipulating the iPhone to control the car around the marker-card laid in the middle of your own room. 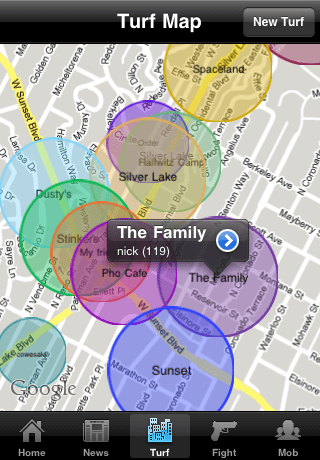 Go geochasing friends and strangers with your iPhone. Play it inconspicuous like an agent, hidden like a ninja or offensive like a pirate. 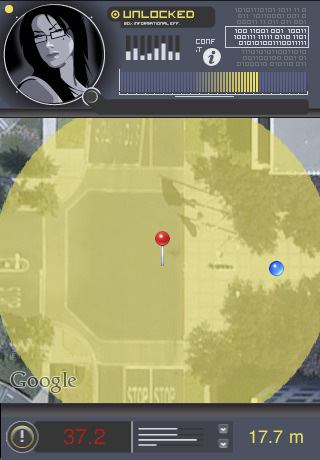 GeoChaser uses GPS to locate you and your opponents. Your positions will be displayed on a map. Unfortunately, the GPS+compass combo isn’t accurate enough to help you identify targets. But it’s probably more fun than matching tweets with tweeters – as many apps do today. The game looks awesome in the video. In reality, the players generate the fun – not the game. What’s its “added value”? When shooting a photo of your opponent, it recognizes the color of your opponent’s shirt. If it’s a hit – it will make your opponent’s iPhone vibrate. Neat? Yes! Augmented? Ah…who cares. Is it enough to become a best selling game? It will have to do more than vibrate. AR history buffs among you will remember this game was originally conceived way back in 2007 for the Android phone; does Wifi Army ring a bell? Or the Lumix Battle commercial? The world is the battlefield, your phone is your weapon. Players organize in 2 teams armed with cell phones with the goal to locate and take pictures of their opponents. The phone compares captured pictures against a database of player faces and awards points for correct hits. Nevertheless, Stage Two deserve kudos for thinking about fun before technology – and making it happen. 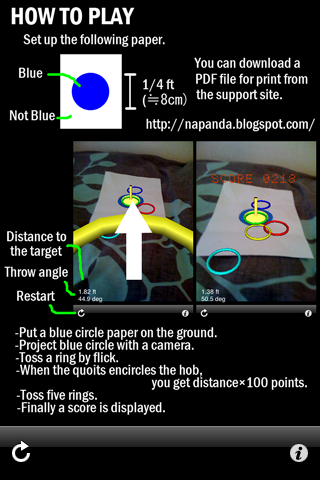 Toss virtual rings by flicking your finger onto a blue circle (drawn on on a white page). The circle is overlaid with an upright peg. Try to hit the peg. The farther the distance – the higher the points you score. This was a huge surprise. The app is poorly designed, and it seems like it was put together in a haste. However, this is the only app on the store that actually analyzes the pixels on the screen (looks for the blue circle) and overlays graphics (the yellow upright peg) so it’s perfectly aligned with the circle. Yes it’s blinking, the tracking is far from being robust, and the game play is definitely not much fun…but it’s the closest thing to augmented reality you will find on the app store in 2009. Overlaying flying bullets aimlessly on a camera view doesn’t cut it for me. Not even if I have a bunch of switch weapons to choose from. And yet, such games sprung up like mushrooms after an October rain: MGD (Most Dangerous Game), Assassins FPS by Differentium, iPew by Wumbitz, Firepower by Todd Hopkinson, VRArsenal by Quickdecay, First Person Shooter by Blueriversa, HandsUp by Assaf Waisler (introducing a new weapon – kisses). hiBubble by BorderTown and Snowglobe by Maverick, get a special mention for breaking away from weapons, and blowing bubbles and snow respectively, instead. Does anyone play these games, or are they just too tempting to build? Wanted Dead or Alive by Poulet Maison (House Chicken in French) has style. I admit. The sound track sets the expectations for a AAA game – but sending friends photos of my appliances riddeled with bullet holes – isn’t my kind of fun. iSpy by SplitP is based on an extremely simple yet clever concept: take photos of real world objects and challenge other people to try and find it – it’s all about getting out and experiencing the real world – games alfresco style. Take over real-world territory in your neighborhood with Turf Wars, the new GPS-enabled crime game for your iPhone and iPod Touch! Turf Wars is the massively multiplayer online game where you claim and defend real-world territory from other mobsters. Parallel Kingdom is a mobile location based massively multiplayer game that uses your GPS location to place you in a virtual world on top of the real world. Through this game, you can almost see how MMOs and virtual worlds will look like after migrating from PC screens to the real streets. Booyah by MyTown – location-based games meet monopoly. Buy and own your favorite real-life locations. Collect rent when other people check-in to your shops. Upgrade your shops to increase their value. 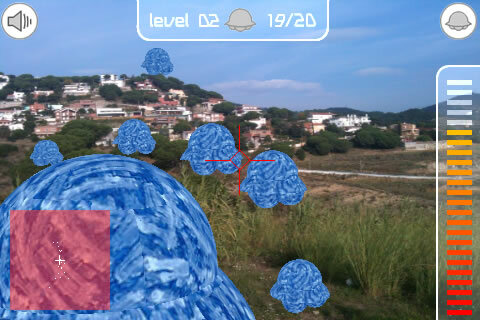 Get away from your pursuers in an augmented reality survival. Turn your everyday life environment into a playing field : you’re tracked down by ennemies’ satellites, escape from the area watching over, in the time alloted. Eye Hound pulls you in with great graphics, sound effects, and promising a unique interaction – but the action is soooo000 repetitive that it wipes out all the positive points. It might be an alternate reality game – but not an augmented one. Sometime apps can inspire games as well; watch out for these wanna-be-games apps as they evolve. They look like apps, they talk like apps – but when you do something good like checking into a bar – you get points, badges, or if you’re a frequent patron, you could even become the mayor of your favorite pub. These apps marry social networks with GPS to help you explore your city in new ways. – CauseWorld – same mechanics with a socially responsible spin: points you earn transform into sponsored donations to important causes. Have you been rejected from the app store? Tell us your story. That concludes our review of Augmented Reality games in 2009. Overall, we have reviewed more than 20 AR games, and identified several highlights and a handful of disappointments. The biggest achievement of the year: tens of thousands of players got their hands dirty with AR games for the first time in history. And the promise is much bigger. Prepare for 10x more games in 2010. And keep in mind: to make these games 10x more fun, we’ll need better design – not necessarily better technology. Wanted! Game designers! Game designers! Game designers! Happy New Year to our devoted readers and contributors. A million thanks to our own Rouli for an amazing coverage of the augmented reality scene. And finally, welcome to our fantastic new author – Tom Carpenter. 2010 will unveil an awesome reality.